Go into a Starbucks. Order a French press of coffee. 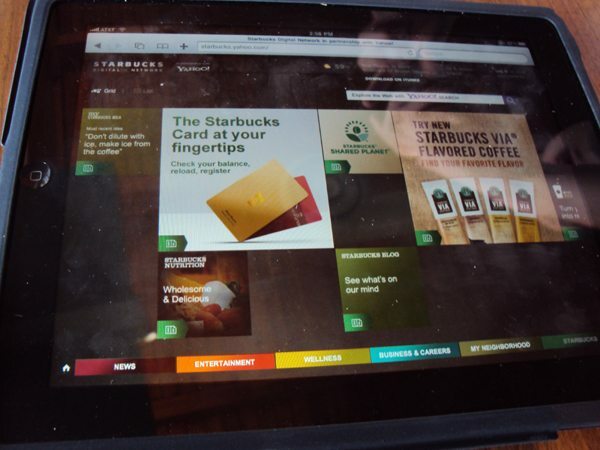 Explore the new Starbucks Digital Network. 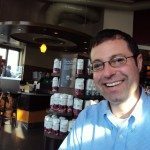 I caught up with Adam Brotman today (10-27) to talk about the new Starbucks Digital Network, launched on Wednesday the 20th of October. It was my first glimpse at the cool content available on the new Starbucks Digital Network. We drank a French press of Organic Shade Grown Mexico coffee, paired it with banana bread and pumpkin bread, and talked about this new digital network inside a Starbucks. We met up at a Starbucks close to work, at First and Walker in Seattle’s SODO neighborhood. The new Starbucks Digital Network is available to customers only while they are inside a Starbucks and to get to it, you need to visit http://starbucks.yahoo.com. I brought my new iPad to the meeting with Mr. Brotman and learned that “AT&T enabled-devices are self-authenticating”. 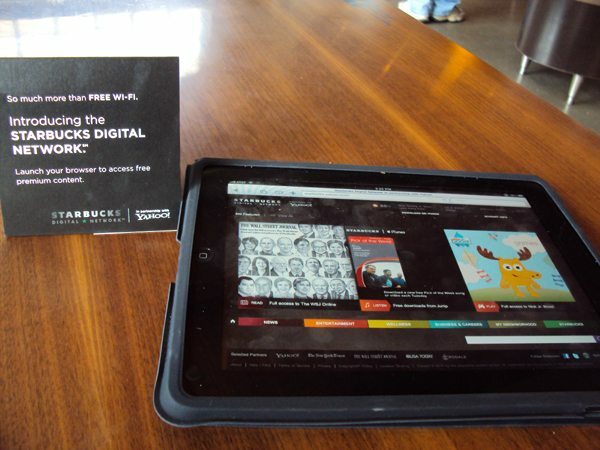 This means that if you walk into a Starbucks using an iPhone or an iPad, you will automatically connect to their digital network, bypassing the landing screen of the Starbucks Digital Network. If you want to take advantage of the content at the Starbucks Digital Network, you’ve got to take the simple step of going to the url mentioned above. Here it is again: http://starbucks.yahoo.com. I asked Mr. Brotman if there were any plans to have customer-created content on it, much like a community bulletin board at a Starbucks. He didn’t entirely rule that out, and said that the idea behind this digital content is that much of it IS intended to be hyper-local. By clicking on the tab which has the name of the Starbucks you’re at, you connect with the possibility of a Foursquare login, and there are all kinds of local information such as the temperature outside, and even what’s playing inside the store. Since I have been at MyStarbucksIdea (since March 2008), I recall seeing numerous threads asking for more music information (about what is ‘now play’) readily available in the stores. Please disregard the point totals. Having been a participant at MyStarbucksIdea since its launch, I can definitely say that down votes don’t always really mean that it is a bad idea. People vote threads up and down for lots of reasons unrelated to the merits of the idea. The only point during the meeting where I pretty much nagged at Mr. Brotman was when it came to MyStarbucksIdea: I wanted the link to be bigger, more obvious, and more visible to a Starbucks Digital Network user. Oh well, we can’t have everything we want! 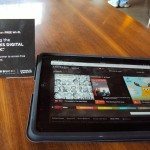 If you are wondering what else you might find at the Starbucks Digital Network, you’ll find all kinds of content from music to books to news to you name it. There is an iTunes down-loadable pick. 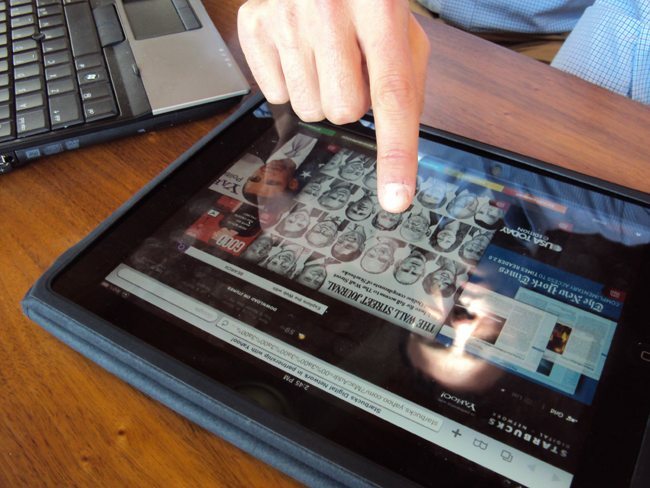 A customer can read the Wall Street Journal, the USA Today, or the New York Times. You can even read a book online, search for a job, or look for restaurants in your area. The Starbucks Digital Network seems to be a pretty powerful toolbox of fun stuff to do catered right to your location. There are even some free games for kids to play. 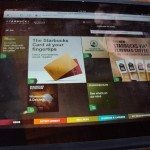 Is Starbucks switching to digital menu boards? Goodbye paper! A beautiful new Starbucks in a hospital in Australia! Any time I try to explore all of SDN I find something awesome and get distracted. LOL. Suppose that’s a great problem! There’s a lot of good content on Starbucks Digital Network. Also, nice ipad, Melody! Love the iPad! Very nice! I hope you’re enjoying it! I haven’t had a chance to play around with SDN much yet! I’m hoping I can find some time this week to drop by Starbucks for some sit-down time and bring my laptop along with me! I can’t wait to check it out some more. As always, love the pictures! Great conversation with Adam and nice to know that there might be a chance to have local content and a community bulletin board available. This morning I saw all the table signs for the SDN and they also had some bigger signs around the store. Great interview Melody and thanks. Wow. Starbucks in USA offers so much more than here in Japan. I’d be happy just to have free wifi, but this network sounds really interesting. I’m definitely going to try this out when I get a chance! I think it is great that Starbucks is still trying to do different things and their efforts with SDN are admirable. I agree with John Moore that this seems to be a “why bother” as it’s likely to be ignored, however, that does not mean that it cannot be successful. Portal concepts are dated. However, content is still king and Starbucks has done a great job of aggregating some wonderful content. 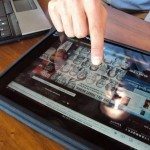 Perhaps the answer is in bringing the user into the experience – with integration with Facebook, Twitter, MSI and even StarbucksMelody.com. I doubt most people are spending time at places like the SDN these days. Most log on to go to their social network – those have become their platform/portal/launching point for content, conversations, etc. Maybe the Apple/Starbucks partnership could find a way to integrate Ping into the SDN. Apple has an uphill battle with Ping vs. FB – maybe a Starbucks connection could help. In a nutshell: There’s potential, but not simply by doing the 90’s thing better than was done in the 90’s. SDN is great! Lucky enough I had the chance to check it out last week during my stay in the U.S….the design and appearance of the network is really nice and very apple-like. @Sebastian! Very cool I didn’t think about that, but you were still in California on vacation when the SDN launched? I think it’s awesome you got to experience before you went home to Germany. I would assume that someday there will be an international SDN offering, but maybe we’re a long ways away from that. I knew you would be proud of my ipad! You’re a brand advocate for apple you know! @CD – I think one of the bigger challenges will just be getting people to the right url because you could bypass the SDN portal entirely if you’re on an iphone. and it seems like tons and tons of people are using the iphone. It won’t be many, but the 500 people who view this blog will at least have the right url. I’m excited about the content being offered. It genuinely seems like a valuable content offering. I’d love to be able to sit and read a USA Today on my ipad in a Starbucks, free from SDN. @Kaori – Get an ipad! You’ll like its convenience! To everyone in this thread: Thanks for the many comments. The best part of all of this was just meeting with Adam and seeing his very genuine enthusiasm for the content on the SDN, and his genuine enjoyment of a good cup of coffee. That, is a fabulous combination. @Mel – I gotta say that I think the URL approach is the wrong approach. If they don’t put it in front of customers, most are never going to see it. When you sign onto WiFi at most places, they redirect you to their start/welcome page once you have authenticated. 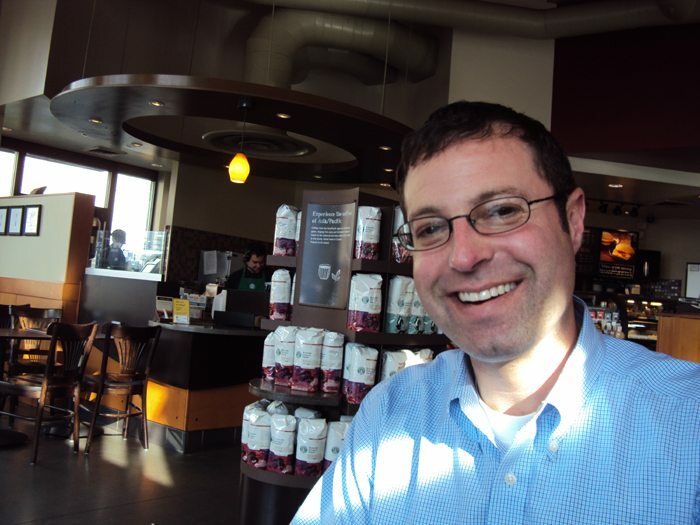 Hopefully Starbucks is doing that and the SDN is the place they are being redirected. While “self-authenticating” is great for the AT&T products, if it means you are free to begin at any site, Starbucks has given away the opportunity to get those customers to land at their SDN. I agree that the content on SDN is great. They have done a great job of aggregating (some have said they are offering too much). The trick is to get customers to see the content and return to the SDN so that Starbucks (and their content providers) see results. This can’t be done if SDN is being bypassed or overlooked. I like that Starbucks is trying to do this, I just think they have their work cut out for them and they’re going to have to approach this differently. I tweeted Adam saying that the AT&T customers should not be able to bypass the SDN – it’s a loss for the customers, Starbucks and the content providers (who would really like the great demographic that is AT&T’s customers looking at their content). Your iPad experience is the perfect example. You had this awesome new shiny device and checking out the SDN with your iPad and Adam was one of the first things you did with the device. But what happened? You had to go to a URL instead of it just launching on your iPad when you connected to the network. That’s a huge missed opportunity and your experience sums it up – great content, great site, but you would have missed it if Adam hadn’t directed you to enter the URL. Not to hog this thread, but Adam tweeted back and they’re working on getting the content in front of AT&T customers. Great to hear that. Oh Melody! You DID get an I Pad…… ??? they are very attractive but right now, I feel I have more than enough. Since I rarely use the wifi in Starbucks, unless I am traveling, It’s nice to know it’s out there. Love this interview Melody. I’m an iPhone owner, and couldn’t figure out at first how to get to the content when I tried to see it on my breaks at work. AT&T park in San Francisco has free WiFi, it’s self authenticating for AT&T users, but still has a splash page for the special content provided to those users. Hopefully, Starbucks and Yahoo can come up with something as well. It’s not in your interview, but I believe I saw Mr. Brotman quoted as saying over 50% of all the WiFi connections made in the stores were made on mobile devices, so they definitely need to continue to improve that experience for users. My favorite feature is getting to read all the subscriber content on the Wall Street Journal. I’m spending all my break times on wsj.com! COOOLLLL!!!! And so cool that you have an iPad. Good choice! Still having numerous problems with using my computer at home pulling out my hair! Anyway, got to SB this morning and used the new system and like it alot.